Read Part 1 of this blog entry if you haven’t already. Did you do it? Good. So it was now a few weeks before Christmas, and VANCE MAJOR was ready to tag out and I was ready to tag in to try to get this compromise settlement for STARBASE STUDIOS to the finish line. Vance was exhausted, but he got the runners 90% of the way there. Just a few teensy details left to work out…or so I thought. Keep in mind, neither Vance nor I is a lawyer. 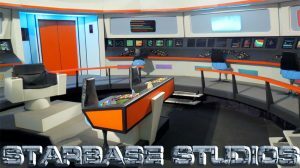 Instead, we were just trying, as friends, to help SCOTT JOHNSON and KENT EDWARDS work out a way where GLEN L. WOLFE would drop his lawsuit against them, and Starbase Studios could continue without fan filmmakers having to pay hundreds or even thousands of dollars to use the Starbase Studios TOS sets. By the time I tagged in, there was a full legal settlement agreement already written up by Glen’s lawyer, ready for Scott and Kent to sign. But they still had some issues with it. One of the biggest was that Scott decided that he didn’t want Glen to own 100% of the Starbase sets. But he was willing to split them 50/50. Would Glen agree? Scott didn’t think so. And frankly, neither did Vance. 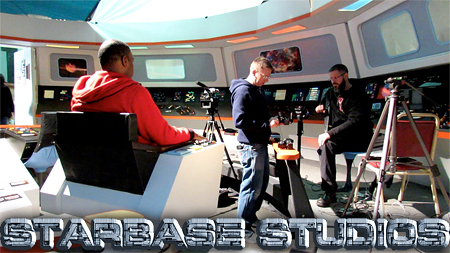 There’s a lot going on behind the scenes at STARBASE STUDIOS recently, and I’ll get to that in a moment. But first, you might want to read up on the current situation if you don’t already know about the lawsuit and all of the other drama going on of late. All right, strap in. Let’s start with this past weekend when a group of 5th and 6th graders from Parkview Elementary School Music Club got a chance to film a music video project on the amazing TOS sets of Starbase Studios, currently located in Marble Falls, Arkansas. 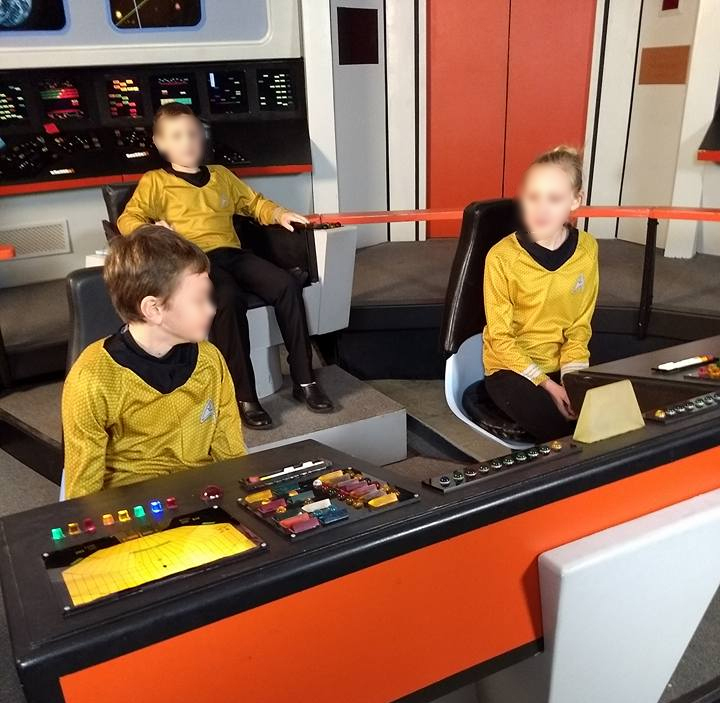 The field trip was set up by their teacher, KEVIN CROXTON, who had composed the music for THE FEDERATION FILES’ second episode Walking Bear, Running Wolf last summer. In exchange, Kevin had asked show-runner GLEN L. WOLFE for the opportunity to bring Kevin’s music students (they’re local) to the sets to film a video project. So this past weekend’s excursion has been planned for nearly 7 months. 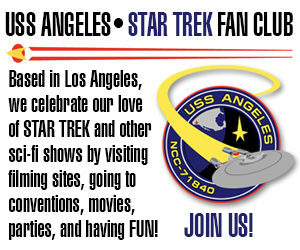 And, really, isn’t this what Starbase Studios is all about? Sets by the fans, for the fans…and even attracting a whole new (next!) generation of young fans. So what could possibly be wrong with that? Yesterday, we looked at the history of STARBASE STUDIOS from its founding in 2010 to its move from Oklahoma to Arkansas at the beginning of 2017. Things started to get tense and messy by early summer, with DAN REYNOLDS stepping aside, leaving GLEN L. WOLFE wanting to charge fan producers $500/day (plus extra fees) to use the studios TOS sets and resources…while SCOTT JOHNSON and KENT “WORDS” EDWARDS wanted to keep the sets free for use by fans (only requesting a donation to cover the cost of electricity for the day). And as long as CHARLES “BUD” PELSOR, the landlord of the warehouse where the STARBASE STUDIOS sets were being housed in Dogpatch, AR, was providing free rent until the end of 2018, offering use of the sets essentially for free was certainly doable. Then, in early August, as recounted in this recent blog a large number props and items both freestanding and attached to the sets were removed and taken from the warehouse. It was not a break-in, as there was no indication of forced entry. 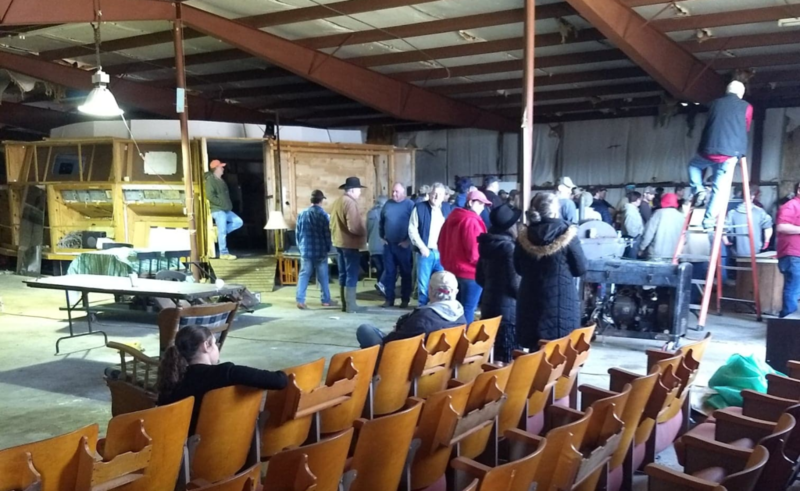 Later on, when the police were brought in,they spoke with Glen’s attorney who explained that the items taken were the personal property of Glen Wolfe, and if Scott and “Words” wanted to prove otherwise, they would need to do so in civil court. The police then told everyone that they would stay out of the matter until ownership was clearly and legally established. 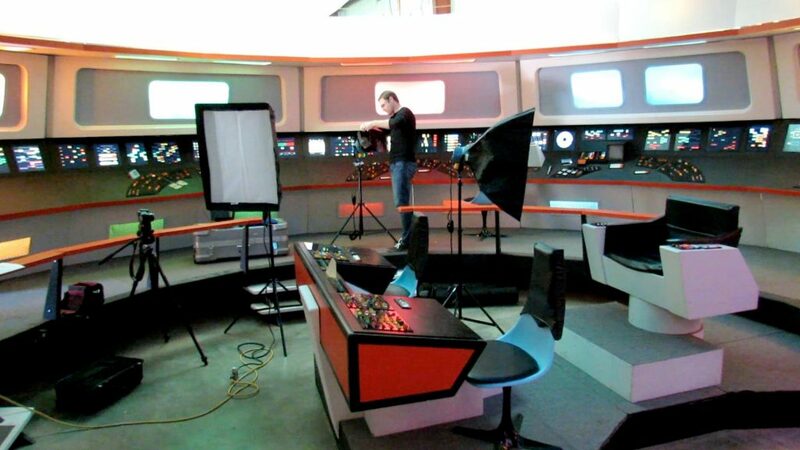 As you might recall from this recent blog, SCOTT JOHNSON and KENT “WORDS” EDWARDS, with the help of VANCE MAJOR, posted a video showing many critical pieces of the TOS sets that were removed, 90 days earlier, along with damage done to the remaining set pieces during the removal process. But the question must be asked: was this “theft” and “vandalism” or simply someone reclaiming his personal property? And it is now looking as though that question will end up being answered in an Arkansas courtroom. There’s a LOT of ground to cover right now, folks, and I’m going to share as much as I’m allowed to while trying to break this whole situation down for you. Ready? The fan film world was jolted yesterday to learn that STARBASE STUDIOS, which had recently relocated from Oklahoma to neighboring Arkansas, has shut down—at least for now—due to the removal of critical pieces of their TOS sets and damage to items that still remain. 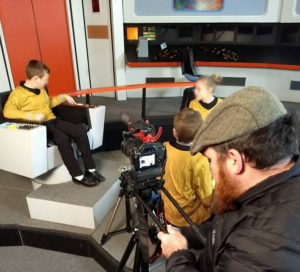 To document was was done to the sets, KENT “WORDS” EDWARDS and SCOTT JOHNSON, two of the four joint owners of the Starbase Studios sets (the other two owners being GLEN L. WOLFE and DAN REYNOLDS…although it is possible that Dan has stepped away; I don’t yet have confirmation on that) have made a 22-minute video with the help of prolific fan film-maker VANCE MAJOR. You will notice that the video bleeps out the name of co-owner Glen Wolfe. This is because Glen was the one responsible for the removal of the set pieces. Now, before anyone starts targeting their phasers on Glen, I want everyone to understand that there are, in fact, TWO sides in this situation, each with reasonable grievances against the other side. I have friends on both sides of this, and I have been speaking with them over the past two months off the record. That was their request, and I have and will continue to honor it. The hope on both sides was that this matter might be resolved before needing to make it public. Obviously it hasn’t been, and now Scott and “Words” have decided to take the next step for them, which is releasing the above video. I have promised each side that I will report this story as fairly and objectively as I can, quoting each of them with minimal editorializing. I have been told that Scott is now willing to speak on the record, and I’ll reach out to the other side shortly to see if they are ready, as well. However, the one thing I can report on right now is why the police are not getting involved in what appears to be a case of theft and vandalism. And that’s because it’s not. Glen is a co-owner of these sets, and if he has a key (which he does), the police do not consider that to be breaking and entering. Moreover, when there is a question of ownership, such cases are not considered criminal but rather under civil jurisdiction to be fought over by business lawyers. In short, like it or not, this is a civil case…if it does, in fact, wind up in court. I beg your indulgence if I don’t get around to reporting on this further until next week. I’ll be volunteering at my son’s school all day for their Halloween carnival and then trick-or-treating with Jayden tonight. Then I have to clear time to speak to folks on both sides of this mess and organize their comments into an objective and coherent presentation for all of you. Please stay tuned.